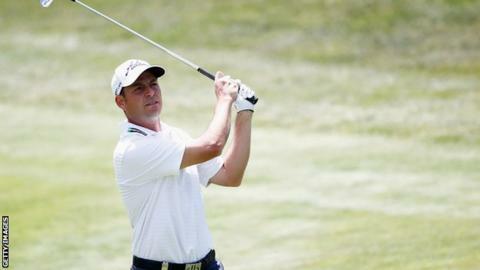 English pair David Howell and James Morrison share the lead heading into the final day of the Spanish Open. Morrison carded a four-under-par 68 at the Real Club de Golf El Prat, near Barcelona, to join Howell, who shot 69, on a seven-under 209 on Saturday. Italian Francesco Molinari is two strokes adrift after a third-round 70, with Sergio Garcia also in contention. "I'm delighted to be in the mix again," said Howell, 39, who has recorded three top five finishes this season. "I haven't managed to win this year but I've given myself three chances and this is going to be a fourth. Hopefully I'll do it tomorrow." Both Morrison and Howell overcame double bogeys to take a share of the lead. "It's been three very silly days," added Morrison, 30. "The first day I was three over after five holes and today I made a seven out of nowhere and fought my way back again."